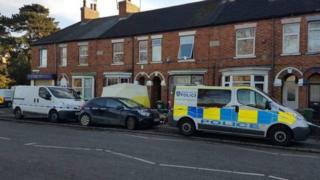 A man has appeared in court charged with murdering a pregnant woman found dead in her own home in Milton Keynes. The body of 29-year-old Ella Parker was found at a property on Newport Road, New Bradwell, on 7 December. Ryan Blacknell, 24, of no fixed abode, was remanded in custody at Milton Keynes Magistrates' Court. He will next appear at Luton Crown Court on Friday. A post-mortem examination found Ms Parker died as a result of puncture wounds to the neck. Thames Valley Police has referred itself to the Independent Police Complaints Commission (IPCC) over its response to a missing person report which is connected to the death.